Cast: Ben Stiller, Robert Downey Jr, Jack Black, Tom Cruise, Steve Coogan, Matthew McConaughey, Nick Nolte. Written and directed by Ben Stiller. Story: War movie becomes reality. Tropic Thunder could've been a horrible mess, but will you look at that, it's turned out really well. Robert Downey Jr steals the show again, making 2008 a superb year for him, after the surprisingly good Iron Man - and he's playing Guy Ritchie's Sherlock Holmes next year too. Here he's an Australian actor who's taken Method Acting a little too far by having skin pigmentation to make him look African American ... that could've fallen the wrong side of offensive. Fortunately it's plain funny, largely thanks to Downey's not-quite-serious performance. Ben Stiller (who also directs) and Jack Black team up as the remaining actors doing a Vietnam war movie, unaware that's it's all gone a bit real without them noticing. Other faces to spot include Nick Nolte, Steve Coogan, Matthew McConaughey ... and can that baldy man really be Tom Cruise? Yes it can, and what a riot it is to have him in such a self-deprecating role! Kudos to his agent for hooking that one up. 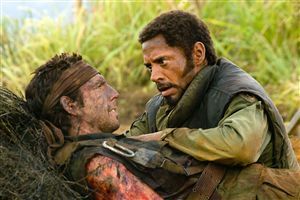 Tropic Thunder is great fun - there's always something to watch and despite hinting that it might, it never dips into the syrup that big budget movies so often do. I'm only docking it a mark for not being particularly funny - it's a pleasure to watch but you're unlikely to actually laugh much. Don't let that put you off though, this is great stuff. To enjoy this film: be on its side. Tropic Thunder was released in the UK on 19th September 2008.